PA denies reports of a deal with Israel to release an additional 250 terrorists, in addition to the 104 already being released. The Palestinian Authority denied on Wednesday that a deal had been reached with Israel that would see an additional 250 terrorists being released from Israeli prisons. The London-based Al-Hayat newspaper had reported that another 250 terrorist prisoners would be released from Israeli jails. According to the report, these terrorists would be released in addition to the 104 prisoners who are being released as a gesture to PA Chairman Mahmoud Abbas. However, the Palestinian Authority’s Minister of Prisoner Affairs, Issa Qaraqe, rejected the report and said it was untrue. Qaraqe also noted that the PA has yet to receive a response from Israel to another request that it released terrorist prisoners who have fallen ill while in prison. The first batch of 26 terrorists out of the 104 that Israel agreed to release was released on August 14, hours before peace negotiations resumed in Jerusalem. 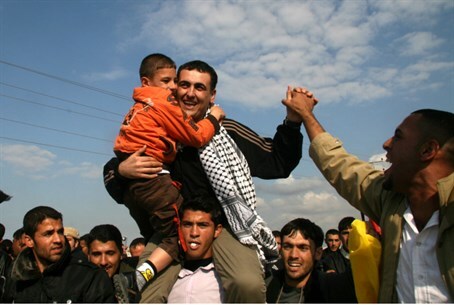 15 of the 26 were transferred to Gaza, and another 11 were received in Ramallah, to scenes of public jubilation. As the 11 terrorists who were freed to Ramallah arrived at their destination, they were welcomed by thousands of cheering PA Arabs and were escorted to the Muqataa compound, where they were greeted by Abbas himself. Qaraqe recently announced that the remaining prisoners will be released on October 29, December 29 and March 28.